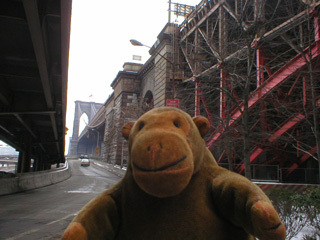 "It's not quite so elegant from underneath"
Mr Monkey set out towards the Lower East Side, which meant going under the Brooklyn Bridge. 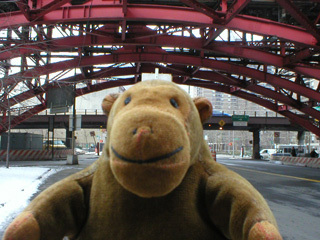 While the bridge looked really elegant when he saw it from Pier 17, Mr Monkey wasn't quite so impressed when he was underneath it. Of course, it might just have been that he had to spend all his time dodging cars.